Since my brother is in town visiting, I decided to hold an impromptu playtest of HeroCraft version 1.2 last night. We invited two friends over for a total of five; a great number to test the Party system with. The mechanics changes in v1.2 included simplification of the Boon use rules and earning one Fame when leveling an Attribute. While players grumbled about not being able to carry multiple weapons to sell later, they definitely loved the +1 Fame for leveling their Attributes, as it both validates their choice and adds a narrative component. Fame is supposed to represent just that, the glory and renown of becoming a hero, and it makes sense to earn it when you master skills or perform great feats. The game went smoothly, and we even had a three-way rush to win at the very end! We discovered and discussed a few more areas that need improvement, and the Armsmaster Attribute is one of them. Armsmaster was one of the earliest ideas for an Attribute and based off the fantasy trope of a dual-wielding warrior. I want to keep it in the game, but right now it's too much of a wildcard. There's too much chance involved in its use, and I want to redesign it for consistency and balance. 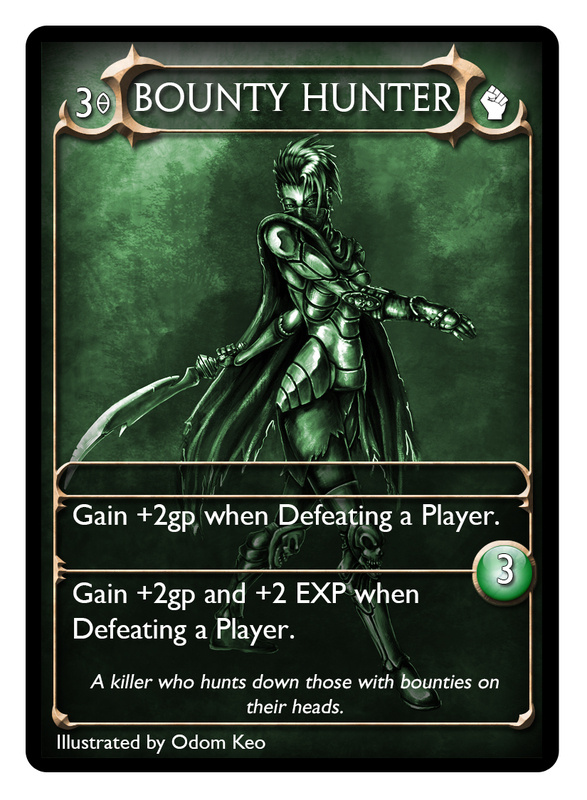 Another card that needs a bit of updating is Bounty Hunter, which I just received art for. 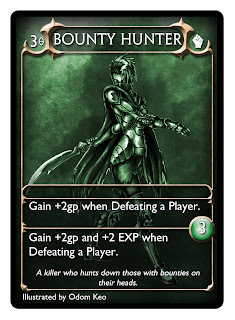 This is Odom's second piece, and after seeing it I knew the card's mechanics needed some love to do the art justice. After I make those changes I'm back to working on a complete revamp of the card designs. I've been busy doing a lot of vector work, and am nearly done with all of the icons for the game. One of my goals is to introduce a set of symbols that works in both the card design as well as in text to help unify the game information. 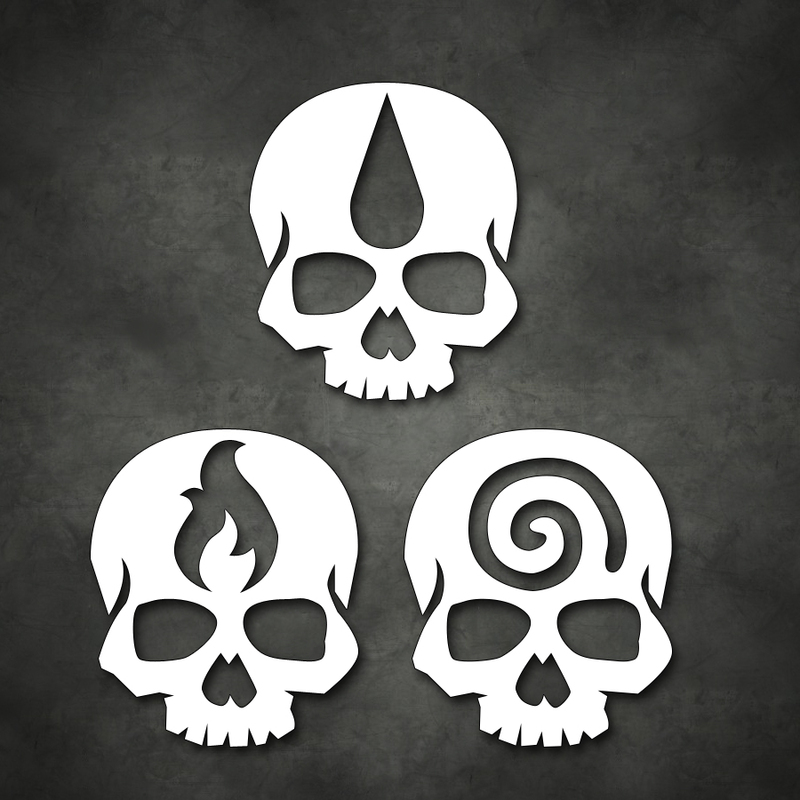 I'm still plodding along (doing "UI" work is not my favorite part of this project, I've come to realize), but here is a screenshot of the Condition symbols: Poison, Burn, and Stun. 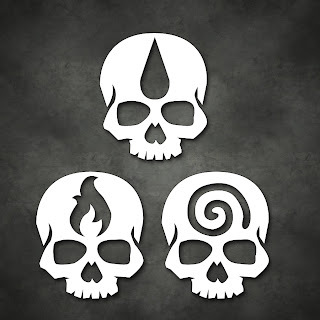 These can be shrunk down to fit inside text, and will adorn their respective Condition tokens. There are a few more icons I need to make revisions to, such as the Experience Orb symbol, but if anything at least I've learned some rudimentary vector skills in the process.